After viewing the first trailer for Mirror Mirror, I was somewhat horrified. Not beating around the bush, it looked awful - it felt heavy handed with the film's worst jokes slammed in. However, even director, Tarsem Singh acknowledged the trailer never worked and several superior TV spots equipped with Marina and The Diamond's Hollywood, fixed all of that. Hopefully this will not have dented the response to Mirror Mirror too much, as its actually a wonderfully entertaining film. 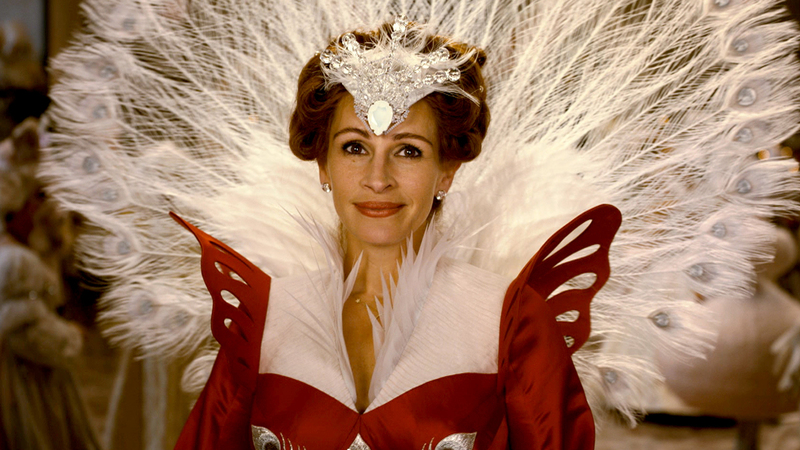 Singh's film follows The (evil) Queen (Julia Roberts) hunting for a handsome and incredibly rich Prince (Armie Hammer) to deal with her financial problems. However, she finds her step-daughter, Snow White (Lily Collins) is getting in the way of these plans and sets to have her killed. Singh's previous film, Immortals was met with a rather harsh critical response, but here at Silver Screen Slags, we loved it. Singh is an extraordinary storyteller and its near impossible not to be drawn into the worlds he creates. The lavish production design, cinematography and costumes help make Mirror Mirror the spectacular visual feast that it is, helping it to be one of the most visually entrancing pictures of the year. Singh has left his own mark on the Snow White story with his charming and whimsical direction, setting it out as one of the most enjoyable adaptations of the classic tale. 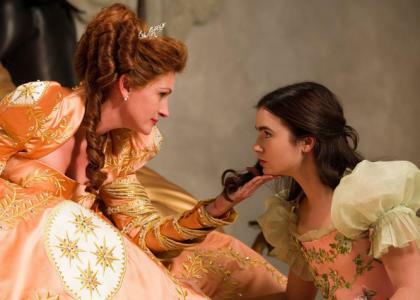 Mirror Mirror is not simply visually fresh, the story has also had a rather clever reworking. The shift to the Evil Queen as the main character is an exciting change - as we all know 'bad guys have more fun' and it is interesting to see the villainous role receive more development than it would normally get. Jason Keller's screenplay also throws in a few winks at Mirror Mirror's source material, playing around with the traditional elements. Unfortunately it is some of the added elements that do not work as well as - mainly the addition of a beast in the woods. The very idea of a monster in this woods has been done to death in fairytale cinema and there is little effort to put a more exciting or original spin on the concept here. The seven dwarves also feature, but the characters are a bit annoying - the writer has attempted to give each their own distinct personality and comic traits, none of which are overly entertaining. However, there is no escaping the fact that the dwarves come with the territory. Clearly the main selling point of Mirror Mirror is Julia Roberts in the leading role. I would not call myself a Julia Roberts fan, in fact, her latest film - Larry Crowne looked like the most stomach wrenching, soul destroying film of all time (did I mention I'm not a Tom Hanks fan either). But, I must praise her here - she's so wonderfully campy and brings a real cartoon bitchiness to the part and is simply a pleasure to watch. Lily Collins is equally entertaining in her subtle performance as Snow White, managing to bring both raw emotion and fun to the part. Stepping into the role of the Prince is Armie Hammer, who impressed in J. Edgar and now steps into a more light hearted territory. Hammer spends a lot of the film half-naked (no one complains), but he is not simply there for these looks, also bringing a great sense of comic timing to the role, allowing for a great rapport with both Collins and Roberts. Nathan Lane is also on hand to bring some comic charm and makes a welcome return to the big screen, after what feels far too long. Be sure to stick around for the end, as there is a surprising Bollywood finale which captures the fun, whimsical nature of Mirror Mirror. Singh has shown us how fairytales should be told - with originality, visual flair and charm. Mirror Mirror never takes itself too seriously and simply asks you to come along for the ride an enjoy yourself. The performances are all solid with Roberts, Collins and Hammer all shining in their respective parts. Mirror Mirror is likely to be one of the main guilty pleasures of the year.